Disclaimer: if you think that Soros/Russia/America/Illuminati is behind the Yellow Vests or some other batsh*t nonsense, then please stop here. This article isn’t for you. Cat videos on YouTube are maybe more appropriate. While the Yellow Vests (Gilets Jaunes) protests actually began on 17.11.18, I think most are aware that frustration with the government has been building for many, many years. Sarkozy certainly played a big role in this. Deep-rooted contractions have been left unaddressed while offshore accounts were filled up. Without wanting to dedicate a lot of space to the details of each French government since the last massive riots in 1968, I think it is easier to proceed from the fact that France has been essentially occupied by America for decades. For me personally, this helps to explain a lot. In Russia there is the word “народ”. The closest translation of this into English is “nation”, but actually it doesn’t really convey the sense. We’re talking about fraternal relations amongst peoples that are indistinguishable from kindred ones. And it’s understandable why this concept doesn’t exist in the West. Or at least, I’ve never seen it. When America landed on Omaha beach in 1944 it sure didn’t have the best interests of France at heart. And the quick formation of NATO in 1949 testifies to this. America succeeded to create a loyal bloc in synchronisation with the USSR’s withdrawal from Europe (by the way, talk about “Soviet occupation” is vulgar NATO propaganda). Normandy was bombarded by US aviation in an act of national subjugation. This is also psychological warfare. After all, it’s no coincidence that as of this very moment Japan – nuked by America – is the No. 1 most indebted country in the world. Africa is another story; the people were stripped of their identity and turned into automated plantation workers for the “civilised” West. This helps to explain why French TV broadcasts American movies, American series, American music, etc on a loop. Or at least until recently. I have noticed that there has been a slight reduction in the last year, but there is still predominance all the same. On TV there is a focus on violence. Children’s cartoons consist of almost endless aggression. Everything is done to create lines of division and pit X against Y. This doesn’t benefit France or Europe, but it does benefit the USA and its EU project. Why? Because how else can American… sorry… NATO military objects be planted on European soil and aimed at Russia? Most French people believe that the USA was a liberator in WW2, and that nuking Japan was justified. The TV reinforces these ideas also on a loop. If you try to challenge someone who thinks such things, you will be on the receiving end of the 3 stages of denial. The creeping annexation of French sovereignty reached its peak in 1999, when the Euro (€) replaced the franc. The standard of living has worsened ever since. After this, French agricultural produce lost its place in its own country to Spanish agriculture (Spain is now an IMF slave), which is riddled with pesticides. As a result, French produce is now much more expensive. Fruits and Vegetables? Extortionate. Sadly, French produce is also a victim of Bayer/Monsanto (hence why the Yellow Vests recently attacked the HQ). I will come back to this topic later, but I have given one early example of the consequences of US occupation. Has it brought anything good? In my opinion, no. Living became dependent on credit. Car adverts on TV infinitely promote debt and unaffordable lifestyles. Part of the parcel of US occupation is being dragged into violations of international law. France played a major role in bombing Yugoslavia and trafficking organs (Bernard Kouchner was heavily involved). It helped to carve the region up and illegally create Kosovo’s “independence”. France helped America invade Afghanistan (invading Iraq didn’t receive enough public support) in Operation Enduring Freedom (nice name, haha). France (Sarkozy) helped America use Georgia as a battering ram against Russia. France was the ringleader in the evaporation of Libya. France helped arm terrorists in Iraq and feed Al Qaeda, which later resulted in the birth of ISIL/ISIS. France helped AFRICOM send weapons from Libya to Syria. France is permanently in Africa, helping the IMF pillage sovereign nations like Mali. France helped Al Qaeda/ISIS in Sy-Raq unconditionally in the media space and with financing. France helped Riyadh send Yemen back to the Stone Age. France helps Israel massacre Palestinians. France (using Bernard-Henri Lévy as the middle man) helped America overthrow Yanukovych in Ukraine and unleash civil war. France has consistently parroted America’s anti-Russia propaganda on Skripal, MH-17, Crimea, Trump “collusion”, etc. And now France helps America bring Venezuela to its knees. Does absolutely any of this benefit France or the French people? No? Then whom does it benefit? The IMF. NATO. Jacob Rothschild (I am “anti-semitic”, yes). Apartheid Israel. Lockheed Martin. Raytheon. Boeing. Goldman Sachs. JP Morgan. Disney. Kelloggs. Qatar. Saudi Arabia. Banderists. Wall Street. Soros. Clinton. AMERICA. Now with this important background information on the table, we will move on to the topic of the Yellow Vests. The initial spark of the protests is the El Khomri law, which essentially robbed employees of their rights. Read more about it here. And guess what? Yes, on March 15th the EU condemned this law. I.e., 18 weeks of protests could’ve been avoided long before this dumb globalist law was adopted. But nope – giving workers a fair exchange for their labour doesn’t fill up offshores. The next scandal that incensed people is the Benalla affair from July 2018. Summary: Macron’s best buddy Alexandre Benalla (some say he’s his boyfriend) violated the law and assaulted a May Day protestor. He then broke the law on diplomatic passports. This particular scandal is never-ending, and, predictably, no punishment has yet arrived. The media even tried to link it to Russia. However, when a Yellow Vest (boxer) acts in self-defence against over-aggressive riot police, he is instantly given a jail sentence. The tipping point was Macron’s 23% diesel fuel tax, which he wanted to implement at the very beginning of 2019. This resulted in 300,000+ protestors mobilising in November 2018 – also known as Act 1 of the Yellow Vests. The government did not respond and pretended nothing was happening. Thus, Act 2 was called, which was even more violent. But again, no reaction from Macron followed. Act 3 happened, and then Macron bluffed – he claimed that the fuel tax hike would be postponed. Then a bit later he announced it had be fully scrapped (a ploy since in early 2019 he started to promote a “carbon tax”). It was only after act 4 that Macron did something. But all he did was increase the minimum wage by a measly €100. Ironically, it became the most-viewed political speech in France’s history. The Yellow Vests collectively shook their heads and continued to protest. Before Act 5 there was the Strasbourg “terrorist attack”. I use inverted commas because I believe it was government orchestrated to try to end the protests. Macron let the perpetrator – who was known to police – walk around a free man BEFORE THE ATTACK when there were chances to detain him. He had also been detained multiple times before and had over 30 criminal offences on his account. An innocent “terrorist attack” is was not. Act 6 and 7 were pretty calm and by this point Macron felt like he had managed to quell the movement. Then there was the boxer scandal of Act 8, which the media milked dry. After Act 9 Macron announced the start of the pathetic “grand debate”, which ended up lasting 1 month. The aim? To buy time and hope that support for the Yellow Vests will drop. Propaganda TV channels were selling this “debate”, which has now ended, as “a new stage of democracy”. In reality, it was a re-run of Macron’s electoral campaign and simultaneously his campaign for May’s EU elections. A PR technology, or a monologue. Act 10 took place relatively calmly. 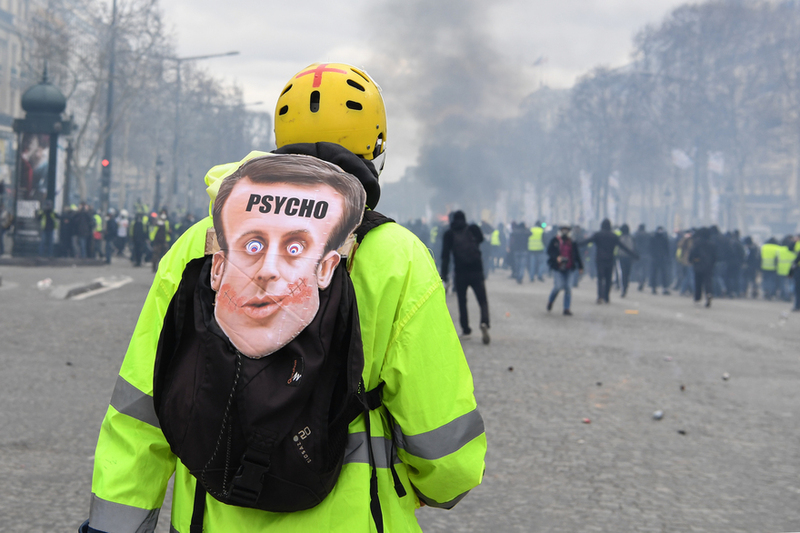 Then during Act 11 Macron’s goons fired a “flashball” at the face of a prominent YV – Jérôme Rodrigues. All testimonies and proof show that it was a deliberate act. As a result, Jérôme lost the use of his right eye. Act 12 was mostly about condemning police violence and was dedicated to Jérôme. Act 13 involved a Yellow Vest’s hand being blown off by a grenade. The media never told people that these dispersal grenades are loaded with TNT. They never showed the footage, and referred to the incident as a “minor injury”, even blaming the protestor for approaching the grenade. Act 14 is when the Zionist rat Alain Finkielkraut was “greeted” by the Yellow Vests, after which the media started screaming “anti-semitism” non-stop. I couldn’t watch the TV for days after this, the level of social engineering was vomit-inducing. In essence, every channel tried to say that all Yellow Vest protestors are supporters of the Holocaust. Act 15 and 16 were different in the sense that the Yellow Vests decided to stop declaring their protests and instead did unsanctioned marches. Sadly, this tactic didn’t have much success since the police set up wedges and managed to squeeze and paralyze the Yellow Vests. It started to resemble sheep being herded by the police in the streets.